As promised, I have finally turned my attention to the NONFICTION Pushcart Prizes and will soon be posting a ranking of magazines that have been recognized for their nonfiction. I’ll do this in a few stages. First, I’ll post a list that ranks solely by Pushcart Prizes won over the last 5 years. Next, I’ll push that back to 9 years. I’ll then add the data for the Special Mentions won over the same period (or possibly in phases, since that’s quite a chore), although this is unlikely to have much impact on the overall rankings at the top of the list. Finally, after the 2012 volume arrives in November I’ll add the new data at the same time I update the FICTION list, so that both lists will reflect 10 years of Prizes and Special Mentions. I’ve also started work on a POETRY list, but I may not get that finished until the winter (think snowbound). The first phase is complete. As noted above, this is a ranking of magazines from 2007-2011 based on the number of Pushcart Prizes won for Nonfiction, plus the Special Mentions earned by magazines that also won Prizes. It does NOT include any magazines that only earned Special Mentions. In the coming weeks, this list will be expanded to include Prizes won from 2003-2006 as well as all Special Mentions during the period 2003-2011. 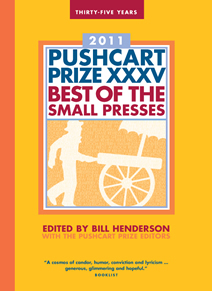 It will be updated in November to include the 2012 list when the new Pushcart Prize volume arrives. Tears will not dry until they die"